This is just incredible! I love how the colors seem loose and flowy, it's so pretty to look at! Wah, thanks so much! And sorry for the super late reply! I really like revisiting this one, the tones, lighting, and colours are spot on, all put together expertly with great style! Great photo! I like how you included the X-Wing in the foggy background of the photo and Poe. I really love your art style. Epic work!! 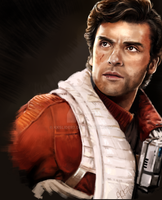 Nice Are you going to do Rey or Kylo Ren next? I love X-wing pilots - this definitely hits the spot for me. Love seeing this in your unique, dripping style - such a lovely effect.